More than 9,000 children and parents met robots and Ghostbusters, tried their hand at robotic surgery, played with planets, walked through a giant colon and had fun learning about science, technology, engineering, math and medicine at the fifth annual Connect2STEM at the University of Arizona College of Medicine – Phoenix campus in downtown Phoenix on Jan. 26. U.S. Rep. Greg Stanton opened the day, encouraging kids to try the 200 hands-on activities. 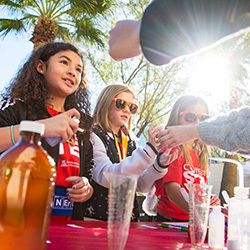 Organized by the UA College of Medicine – Phoenix in partnership with Cox Communications, Connect2STEM is the kickoff for the Arizona SciTech Festival, a two-month campaign promoting science events across the state. Tim Duenas, an electrical engineer, brought his four kids to the event to show them “engineering-type stuff.” They loved the robots, he said, and their favorite was the activity that extracted DNA from a strawberry, hosted by the University of Arizona’s Graduate Women in Science. Trent Smith, MD, a clinical assistant professor and head of the Division of Rheumatology at Banner – University Medical Center Phoenix, came with his children as well. It was the first time attending Connect2STEM for Pamela Garcia-Filion, PhD, MPH, a research scientist and associate professor in the Department of Biomedical Informatics at the UA College of Medicine – Phoenix, and she was happy to see parents just as engaged as the youngsters. 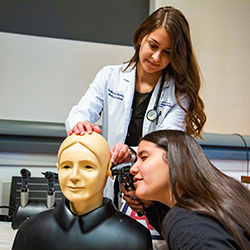 The cornerstone of the College of Medicine – Phoenix exhibit was a vast simulation room where children learned from medical students how to intubate a realistic, high-fidelity mannequin, take vitals, perform ultrasounds, perfect their CPR technique and practice surgery skills with the da Vinci® surgical robot. Kids clustered around cow eye and pig heart dissections, also led by medical students. At the Wildcat Play Hospital, little ones gave their stuffed animals checkups with help from UA College of Nursing students and faculty. Other UA divisions and departments on hand were the Lunar and Planetary Laboratory, the College of Architecture’s Planning and Landscape Architecture, the UA Maricopa County Cooperative Extension, Mel and Enid Zuckerman College of Public Health, College of Pharmacy, UA Phoenix Transfer Admissions Team, UA Police Department, Office of Undergraduate Admissions, UA Alumni Association, Eller College of Management, School of Information, Flandrau Science Center and Planetarium and the UA Cancer Center. The daylong event featured exhibitors from all three of the state’s universities, including the Northern Arizona University Physical and Occupational Therapy programs and Arizona State University’s Graduate Association of Interdisciplinary Neuroscience Students. Professionals from businesses and local community organizations also took part, including Intel Corp., the Challenger Space Center of Arizona, Children’s Museum of Phoenix, the Arizona Science Center, the Heard Museum, Musical Instrument Museum, Phoenix Herpetological Society and the Phoenix Electric Auto Association. Several local high schools were represented with their robotics teams. Sponsors were Cox Communications, Arizona SciTech Festival, Blue Cross Blue Shield of Arizona, USAA, Arizona Public Service Co., City of Phoenix Public Works Department, Southwest Airlines, DPR Construction, Boyer Company, Sundt Construction and Standard Parking.